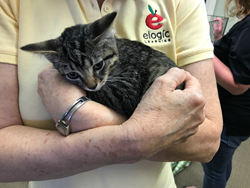 eLogic Learning invited dogs and cats to their office last Monday to support a local animal shelter and to let their employees have a little fun during the workday by playing with animals. Through SPCA Tampa Bay’s Whiskers at Work program, adoptable pets will come visit local businesses and give employees the chance to cuddle some furry pals. An eLogic employee with one of the adoptable kittens. A leader in the eLearning industry, eLogic Learning offers organizations world class, comprehensive LMS technology and content solutions increase efficiencies and productivity and a strong ROI. eLogic Learning’s eSSential LMS supports over five million monthly users and was named the #1 LMS by The Craig Weiss Group, the #1 All-Purpose Extended Enterprise LMS by Talented Learning, and a Silver Award winner in the Best Advance in Learning Management Technology for Compliance Training from Brandon Hall. The eSSential LMS makes it easy to manage eLearning, instructor-led and virtual training events, keep up with regulatory compliance requirements, analyze training usage and results, sell courses online with robust ecommerce features, and much more.